Home ❯ Articles ❯ Fine Gael Leadership Battle All to Play For? Fine Gael Leadership Battle All to Play For? 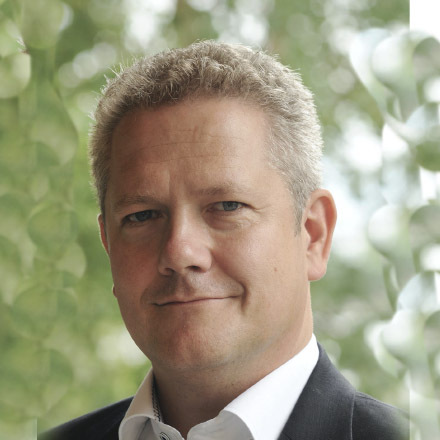 It is a known fact that the individual seen to lead a political leadership coup, or be the favourite at the start of a leadership race, rarely end ups getting the top job. The need for both sides to save face often results in a compromise candidate taking the chequered flag in the final straight. Could this possibly happen in the forthcoming leadership race for Fine Gael? It might seem pretty unlikely, with Leo Varadkar having been the favourite for some time. But stranger things have happened in the past in political circles. Think John Major, or Theresa May from UK politics as compromise candidates, neither of whom were being touted for the top job at the start of any campaign. Some signs things may not be as straightforward begin to emerge in todays poll, when we asked voters who they would like to see lead Fine Gael and act as Taoiseach until the next general election. Leo Varadkar absolutely remains the popular favourite with 29% of all voters, when putting party preference aside, supporting him to take the to job. He also has even higher support among Fine Gael voters with 35% of them supporting his candidacy. However he isn’t as far ahead as he used to be. Simon Coveney is now hot on his heels in the popular voter battle, securing 27% of all voters, as the best candidate to lead the country until the next election. A gap of just 2% on his rival, that had been far greater in polls taken during last year. 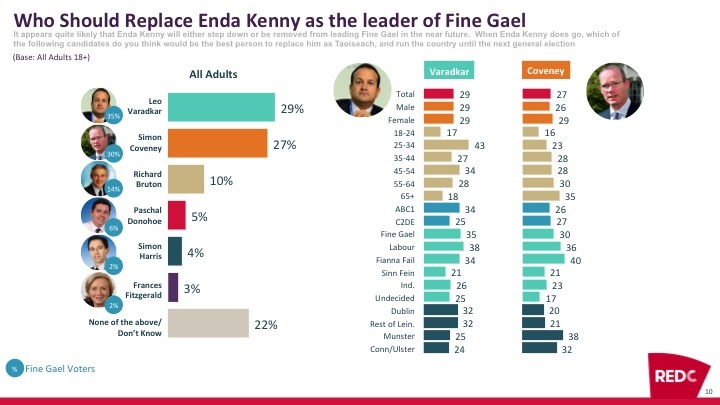 His support does rise among Fine Gael voters, but only to 30%, meaning the gap between himself and Varadkar widens among core Fine Gael voters. Once undecided voters are removed among Fine Gael voters Varadkar secures 39% support, Coveney 33% support and Bruton secures 16% support. This suggests Varadkar is a shoe in, but the gains made by Coveney suggest many are not sure about his taking the leadership, and Bruton could be the dark horse waiting for the final straight of the race to play his cards. Age is the dominating factor impacting support for each candidate. Varadkar support is far higher among younger voters, with over 40% support among 25-34 year olds, but only 18% support among those aged 65+. Coveney on the other hand does much better among older voters, with 35% support among those aged over 65, and only 23% support among younger 25-34 year old age groups. Bruton also has stringer support among older voters, but his support is fairly consistent among those aged 35 and older. With support for the two candidates so close, could the dark horse in this race yet be Richard Bruton? He is the third most popular possible leader of Fine Gael and possible Taoiseach overall among all voters, securing 10% support. This is some way behind his colleagues, but perhaps stronger support than many might have expected. It also means he is clear third choice, or the main compromise candidate for those unable to vote for the other side. He is also seen a safe pair of hands by many. His support also increases by almost 50% among Fine Gael voters, to leave him with 14%. So what impact has this all had on party support? It’s no surprise to see Fine Gael hold support, even despite the apartment mess of a leadership challenge. Any party that gets that much attention in the media during a poll is likely to get some kind of bounce in the polls. But what of Fianna Fail? The first poll of the year saw their support rise significantly, but today they fall back slightly, apparently at the expense of Sinn Fein who makes significant gains at the same time. Sinn Fein gains are very strong with an increase in support of 5% vs. just a month ago, leaving the party securing 19% of the first preference vote. As Fine Gael and Fianna Fail guard the centre ground, and are seen so openly to support each other, this does of course leave the left open to make gains at their expense. There is no doubt that many voters that have been saying they will vote Fianna Fail, were not too happy to see them decide to not bring down the government over the McCabe affair. It is clear that Sinn Fein has benefitted in this regard. It is also clear that the love affair with smaller parties and Independent candidates is very fickle at this time.